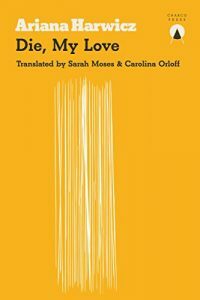 Ariana Harwicz is an Argentinian playwright and novelist for whom Die, My Love was originally published in 2012 as the first of a trilogy, now translated into English and long-listed for the 2018 Man Booker International. 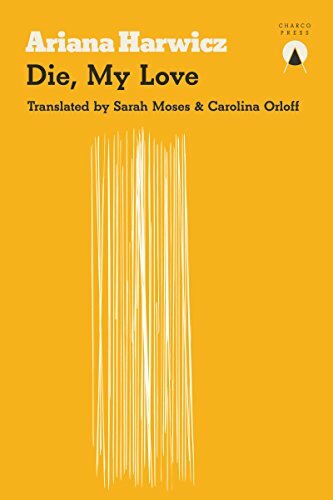 The translators are Sarah Moses and the Scottish-based Carolina Orloff, who co-founded Charco Press through which Die, My Love was published. The book’s synopsis boldly claims that it is ‘impossible to come out unscathed from reading Ariana Harwicz’. My compelling need to do justice to the book within this short review can attest to the truth found in that statement. I want to snarl, to howl, but instead I let the mosquitoes bite me, let them savour my sweetened skin. The sun deflects the silvery reflection of the knife back to me and I’m blinded. The sky is red, violet, trembling. I hear them looking for me, the filthy baby and the naked husband. Challenging themes and the abstraction of an unnamed main character detached from our shared reality make the text sound inaccessible, yet Harwicz’s literary stylings make the novel increasingly immersive. A staccato effect formed by writing in short bursts rather than full chapters forces the reader to engage with snapshots of thoughts rather than the semblance of a whole and complete mind. The first person stream of consciousness narration holds an urgency that pulls readers through the text, while simultaneously the fragmented language keeps you as adrift as the protagonist. The reader is there, but not there: the very paradox of insanity. Come here, he says, opening his arms. No. Come here. No. Why not? Because. What should I do, sweep this up? Do what you want. Are you staying there then? Yep. You could be doing a better job taking care of the house. I swear at him, give him the finger, grow hooves. I know that when he slides open the door I’ll be a black swan, and when he starts shouting I’ll be a castrated duck. I look at him and know that afterwards I’ll have a beak, feathers, talons. Poor little orphan. No one grieves for the wretched woman with scarred arms who was consumed by the misery of life. His temperature is rising. It’s pushing forty. Mine is too, but who cares about the mother’s health. I’ve been needing the loo since lunch but it’s impossible to do anything other than be a mother. Enough already with the crying. In its exploration of the female mind on the brink of breaking, Die, My Love draws comparisons to Sylvia Plath’s The Bell Jar, except the internalised inevitability of female choices are turned outwards in a rage that would destroy that glass jar as easily as the glass door Harwicz’s young woman chooses to smash through.